North America Sheet XII. Georgia, with Parts of North and South Carolina, Tennessee, Alabama and Florida. 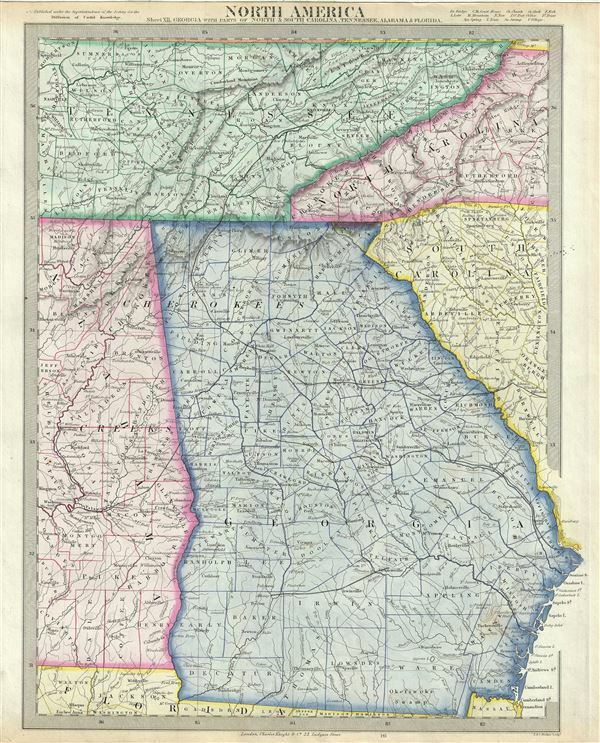 A beautiful 1848 full color map of Tennessee, Georgia and parts of Alabama, North Carolina and South Carolina issued by the S.D.U.K. It covers the states of Tennessee and Georgia in their entirety while only part of the neighboring Alabama, North Carolina and South Carolina are depicted. Following shortly on the events associated with the Trail of Tears and the Indian Removal Act in the late 1830s, this map identifies the Indian tribes of the Cherokees and the Creeks. Several towns, rivers, mountains and other topographical features are also noted throughout. The map is color coded according to states with counties outlined in color. Published in 1848 by Charles Knight of 22 Ludgate Street for the Society for the Diffusion of Useful Knowledge, or S.D.U.K. This was most likely the last edition of the S.D.U.K. atlas to be published before the society formally closed its doors. However, it is known that subsequent reissues of the S.D.U.K. atlas were printed well into the 1870s by Chapman and Hall, who acquired the original plates. Rumsey 0890.139 (1833 edition). Phillips (Atlases) 794.